LITTLE ROCK – After receiving a doctorate degree in entomology from Mississippi State University, Arkansan Ben Thrash is coming home to serve as the new extension field crop entomologist for the University of Arkansas System Division of Agriculture. 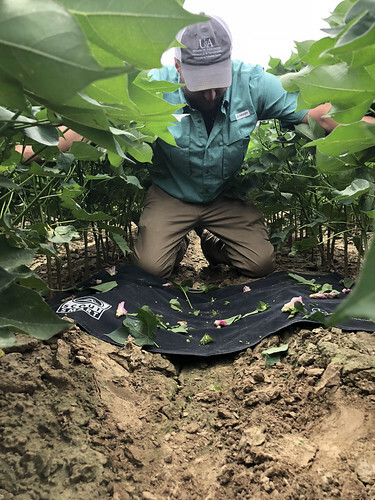 In Mississippi, Thrash worked on refining defoliation thresholds in soybeans. He’s taking his lessons from his three and a half years there, along with master’s degree in entomology from UA–Fayetteville, where he studied stinkbugs in edamame, to his new position where he’ll work to convey university research to Arkansas producers. With more 12 years of experience in research and plot work throughout his academic career, Thrash is excited to finally have a set position in the field. Thrash said that passion is what will make this new position so rewarding for him. Love for his home state seems to be the icing on the cake for Thrash, as he gets to do what he wants, where he wants. Thrash begins his new job Aug. 1. For more information on insect management, visit www.uaex.edu. The University of Arkansas System Division of Agriculture is an equal opportunity/equal access/affirmative action institution. If you require a reasonable accommodation to participate or need materials in another format, please contact your county extension office as soon as possible. Dial 711 for Arkansas Relay.